In 2016, members of the Vancouver Island West (VIW) Early Years Table (formerly the Gold River Early Years Inter-Agency Table), concerned about the results, began to examine factors contributing to this vulnerability. It became clear that there were big gaps in access to services for children and families in the area. Given the remoteness of the area, the distance some families needed to travel for services, and the lack of finances for this kind of travel, children were simply not getting services. The VIW Early Years Table decided what they needed was a model in which families could access services more readily. They applied for funding to create a Children’s Health Hub in Gold River and they applied for funding for a Family Navigator who could work with families to help them access services. They were successful on both counts! 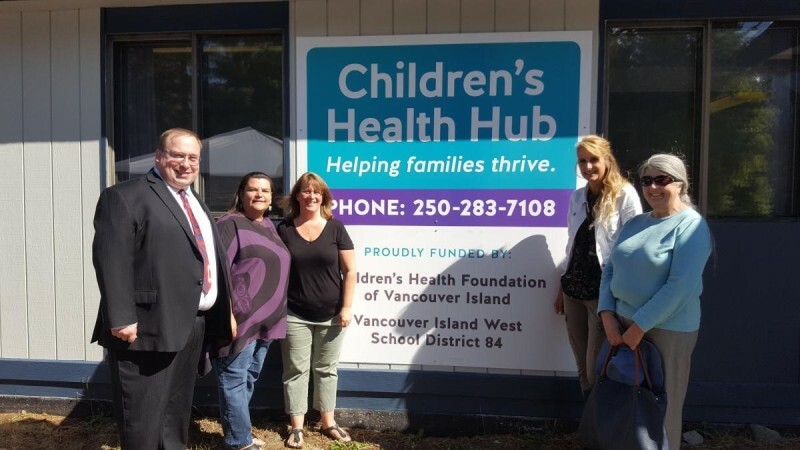 Thanks to the Vancouver Island Children’s Health Foundation of Vancouver Island and the Vancouver Island West School District (SD84), the Children’s Health Hub opened officially in 2017 and it is making a big difference. The Hub is located in the old School District Office and the space and its maintenance are provided by the school district. The school district also administers the finances for the Hub. The growth of the Hub is overseen by a steering committee and a Navigator. A second project funded by Island Health Wellness Grants engaged in research to further examine childhood resiliency in the region. The work of this project now informs the growth of Children’s Health Hub. In their April 2018 Newsletter, The Children’s Foundation of Vancouver Island tells the story of Samuel (shared with permission). “At 10 years of age, Samuel’s hearing issue was finally treated. Although Megan Williams, audiologist, had assessed Samuel at his school in 2016, his family wasn’t able to make it to booked appointments in Courtenay. It wasn’t until Megan saw Samuel and his mother together at the Gold River Health Hub, that she could introduce the idea of hearing aids. The Gold River Health Hub opened in September 2017 – thanks in part to your generous support of Children’s Health Foundation of Vancouver Island. Located right on the local school property, the Hub provides a place for children living in rural and remote communities to meet with a range of care providers. This includes occupational therapists, nutritionists, physiotherapists and audiologists – like Megan. Without the Hub, families had to travel to Campbell River or Courtenay for what is often a ten-minute appointment with Megan. That meant missed school or work – and an added financial strain on families. Megan found that many families just weren’t able to make it. Now that she sees children once a month at the Hub, appointments are rarely missed. A variety of service providers meet with clients at the Hub. Services currently include audiologist, optometrist, counselling, parenting support, occupational therapists, nutritionist, speech therapist and dental hygienist. More services are possible as the Hub grows. The Gold River Hub has already served as a model for another community. Sayward Children’s Health Hub, also funded by the Children’s Health Foundation of Vancouver Island and School District 72 (Campbell River), opened recently. The Hub promises to connect families to services, to share relevant health information and,to deliver timely support locally. The Hub provides health re-sources, support groups, developmental screening for children under six, parenting support and more.